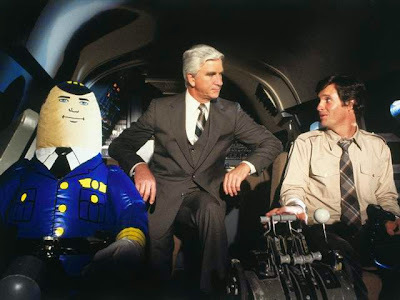 Otto the Autopilot (far left) from "Airplane"
"One evening, an elderly Cherokee brave told his grandson about a battle that goes on inside people. He said, "My son, the battle is between two 'wolves' inside us all. One is evil. It is anger, envy, jealousy, sorrow, regret, greed, arrogance, self-pity, guilt, resentment, inferiority, lies, false pride, superiority, and ego. The other is good. It is joy, peace, love, hope, serenity, humility, kindness, benevolence, empathy, generosity, truth, compassion, and faith." The grandson thought about it for a minute and then asked his grandfather: "Which wolf wins?" The old Cherokee simply replied, "The one you feed." Have you ever gone for a drive in a familiar town and "accidentally" made a wrong turn towards your work, school, or home when you were actually planning on going somewhere else? Perhaps you were daydreaming or listening a bit too closely to the radio, and in that momentary lapse of attention, you went on "autopilot". The thing you did over and over and over superseded your immediate goal of doing something different. In this particular case, all that is needed to get back on track is a little time and a U-turn or two, but what if the stakes were higher? What if your auto-pilot was kicking in after work each day when you pulled into the fast food drive through without even realizing it. What if your autopilot plopped you down on the couch instead of in front of the computer to work on your book, or blog, or venture. What if your auto-pilot lashes out at the people around you, always keeping friends, family, or lovers at arms distance? In other words, what if your autopilot was programmed to make you unsuccessful, unhealthy, and unhappy? You're probably wondering why we even have an autopilot. So far, it seems downright unhelpful, at best, wasting our time, at worst, ruining our life. But imagine if you had to consciously think through every decision you made, every single day, every moment of your life. In this world, your morning "routine" would be anything but. You hand wouldn't immediately head towards the "snooze" button on your alarm, it would blindly reach in all directions. Once awake, you would have to consider whether to get out of bed on the right side, the left side, or the bottom. Navigating your room in the dark would be a nightmare as each possible location for the light switch would have to be explored, and, if you made it out your bedroom door, you'd have to contend with all the options the bathroom provides. As it is, however, you can wake up, get dressed, feed yourself, and get out the door all while scarcely even thinking about it! The bottom line is that being able to run on autopilot gives us a tremendous efficiency advantage. Nature is always striving for efficiency and over the course of our evolutionary history we developed a proclivity for programming our behaviors into routines. Our autopilot is just like the two wolves in the Cherokee story, "the one we feed" is the one that "wins". In other words, the multitude of unconscious behaviors we engage in each and every day are the result of repetition. So what are you doing each and every day? Are you actively "feeding" poor nutrition, productivity, and relationship habits? If that is the case, then these outcomes are not "just how it is" and going in a new more desirable direction is simply a matter of reprogramming your autopilot. Is this going to be easy? Heck no! Is it going to be worth it? Heck yes! Think about what is involved in learning how to walk on your hands, doing a backflip, or heck, even learning to ride a bike for the first time. It feels "unnatural", "unusual", and just plain "hard" to do things that we aren't already programmed to do. Maybe you're reading this and, fueled by a burst of motivation, you start to do things differently for a day or two, but then "life happens" it's right back to the old routine. If this sounds familiar, don't worry, you're not a "failure", you're just normal. You can start living the life you've always dreamed of but inspiration isn't going to get you there. The thing about inspiration is that it wears off, it's the "honeymoon phase" where all the good and happy plans are made and reality has yet to set in. To create true, lasting change, you have to marry "till death do you part" your new behaviors. This is going to take energy, this is going to take effort, this is going to take focus. When you come down from your motivational "high" 99% of the work is still yet to be done. So how do you stay energized and focused in this process? When you first set out on a new course, why should you expect to get there right away? It's silly to think that turning to face your goals means that they will simply fall in your lap, but that's how many of us gauge success. The thought is that if you don't start losing weight, making more money, or feeling happier then right away then what's the point? Unfortunately, our mental autopilot has oftentimes been programmed by television before and afters, quick fix success stories, and infinite opportunities for immediate gratification. While this is good for big businesses, it's not good for you. I intentionally left "in 30 days" off of the title of this blog post because all those people who sell you "fast", "easy", and "quick" transformational, life-changing change are bullshitting you. They want your money, they don't want to help you. I'm giving it to you straight because the truth hurts and change is hard, but "hard" doesn't have to equal suffering. By engaging in the process of reprogramming you autopilot, by "feeding" that "good wolf" each and every day, you are making progress. This progress will not instantly materialize, it may take weeks, months, or even years to really take hold. You have to contend with the fact that you might have gone completely off course with your old autopilot, and the amount of time it takes to correct your path is directly proportional to how long you have been off of it. Rather than being discouraged, however, trust the process and keep doing things differently regardless of "results." Make being different your new "routine" and even if you have the occasional diversion, get right back to it as soon as possible. Don't lament the lost ground, subject yourself to self deprecation, or throw in the towel, your precious energy is much better spent simply returning to the controls and calmly adjusting your course. In time, however, it will get "easy". Once you have fully programmed you new autopilot all it takes are slight course corrections here and there to stay on track. Fitness - Are you drinking soda? Stop drinking soda! Swap it out for kombucha, unsweetened soda water, or regular water with lemon or lime instead. Is this too hard? Then keep drinking soda and ALSO start drinking more kombucha, unsweetened soda water, or regular water. The point is to do what you can. If at first you don't succeed, maybe you just need to lower the bar so you can step over it. If your ego flares up, and it will (ie. "Waah! I SHOULD be able to just quit x, y, or z!") Breathe, relax, and let it go. Your "ego" is just your autopilot trying to preserve itself. Richness - Do you have a monthly budget? If not, start logging your income and expenditures. Any successful business has an accounting department, why should the business of YOU be any different? Can't seem to find the time to do this? Pay someone to! Can't afford to pay someone to do it? Ask for help from a friend or loved one! Not willing to ask for help? Set up an automatic deposit so a portion of your paycheck automatically goes into savings. Many employers offer this and it's something I personally do. It makes saving a significant amount of money each month nearly effortless. Happiness - Close your eyes, relax your shoulders, and take a deep breath. Breathe in through your nose and breathe out slowly through your mouth. Allow your stomach rather than your shoulders to rise and fall with the inhalations and exhalations. Stretch the breath out, taking as much time as you can to breathe in and out while still staying comfortable and relaxed. How you feeling? A little calmer? A little more at peace? A little happier? Happiness is a state of mind not something you buy or do. Whenever you lose sight of this, do this little breathing exercise. By seeing the opportunity to be happy inside of yourself, you are able to see happiness outside as well.